Blast-white and blazing hot! This is an extremely clean example that should be an FBL! Very hard strike, this could make you do a double take because you thought it was a Proof. The Liberty basically has a full bell line- save for a break from a bag mark- otherwise, they’re clearly there! 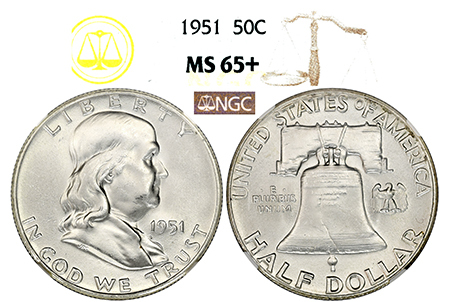 1 of just 15 graded by NGC in MS 65 Plus, this is a superb catch with clean surfaces and a virtually untouched cheek on Franklin’s profile!